Did you think the extra price was worth paying for the card kit? If you don't model in the scale the kit is re-produced in, then No, like wise if you have moved on from using dvd to down-loading everything, that's a waste too. I understand BRM are looking to get a head of the game, Any chance of Video content being available for down-loading in the future ? What do other's think of this ? The short answer is no, but that's only me, I'm sure that there are many who thought it good value. I'll build it anyway and if nothing else it'll be good practice at building and weathering a card kit. Any chance of Video content being available for down-loading in the future ? What do other's think of this ? Highly likely I'd say. The digital edition of the DVD is streamed from YouTube currently, but it's something that will be a necessity as the humble DVD player slowly dies. Thank You Howard, thats good to know. I've not rally done any modelling since the beginning of the year due to work and health issues. However, when I saw Phil building the Metcalfe kit, I thought I'd have a go. The kit is mostly out of the box, except for a whitemetal chimney, since I didn't like the paper one. The white card folds were painted in with watercolours, as per Metcalfe's recomendations. Unfortunately, I only watched their youtube after building the kit! Took about an hour and a half to build, plus longer for the painting. No bad for someone who has never built a card kit! Quite impressed with the kit though. Obviously it doesn't hold up to close inspection as well as plastic(card) due to the lack of texture, but they would be a good way to quickly assemble some background buildings on a large layout. Took about an hour and a half to build, plus longer for the painting. No bad for someone who has never built a card kit! Quite impressed with the kit though. Obviously it doesn't hold up to close inspection as well as plastic(card) due to the lack of texture, but they would be a good way to quickly assemble some background buildings on a large layout. Although I don't wish to sound like I'm playing devil's advocate (well, not this time, anyway …), I suspect that some people might have a different take on this "texture" malarkey. Just how much texture do you really want on a wall - how deep should the "grooves" be between bricks, stones etc.? My guess is "probably not as deep as many people think" - much of the texture on moulded plastic wall sections seems to be very exaggerated (and not always in the right places with some brands' versions of certain brick "bonds"). OK - in the case of plastic "brickwork" sections, the grooves might be deeper than they should be to allow for a couple of washes of different coloured paint to represent mortar - but, even then, some people might regard the depths involved with certain brands as excessive. However, some people might point to another issue - if you mix card kits with certain makes of plastic building kits, the difference in depth of textures could be very noticeable - and this could destroy any illusion of a real scene in miniature. I have, however, read about one exception to this - forced perspective - in which layout builders sometimes put large scale, highly detailed, models, with deep textures at the front of a layout - and small scale, less detailed, models, with "flat" textures at the back, to create an illusion of depth and distance to scenes. Some companies (like Faller) have even been known to sell "background models", specifically designed like this, for this purpose - but I must admit that this is not something that I claim to know much about. For me, this stuff falls into a similar category to having different light (intensity and colour) for the front and back scenes of layouts - I know that some people on this site have done stuff like this - but I've never done any of this stuff myself, so I wouldn't try to explain it. That's a good point Huw in regards to the grooves in the brickwork in particular, some of it is quite overscale. I think it is often what looks right to the eye. Is it better to have overscale grooves and texture, or no grooves and texture at all? It sort of reminds me of the diesel model paradox, whereby in reality most locos have 'ripple-y' sides, but this is never modelled by manufacturers so its not something that we perceive as a problem. Great work Daniel. It's brilliant to see readers' assembled card kits. Good effort too. A nice antidote to listening to Where's my DVD / Where's my Kit grumbles (even after people were told how to get hold of them); you bought it, got on with it and finished it which merits respect from us. It would be nice to see some different variants from it from anyone whose gone with Phil's supporting article about alternative finishes. Nice work Daniel. 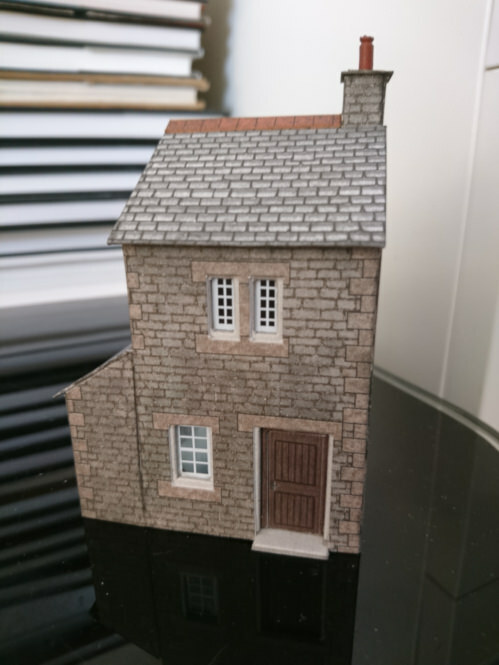 The cottage is a lovely little kit, very usable on most layouts and you've made a good job of construction. On one of my models, I scribed the stonework to add relief- a job I think is well worth doing for a model near the front of a layout. Hugh has a point about scale depths, I suspect that if bricks are printed on the mortar of brickpaper, they are pretty much scale. Some stone has deeper courses though. Having said that, I prefer relief on models even if it is over-scale, but that's a personal preference not a definite "must do". The modification that made the biggest improvement was to spray the building with matt varnish. Shiny stone, even only very slightly shiny as with any card kit, looks odd. To spray a completed model would require a little fiddly masking for the windows but it is worth considering. Whatever you do though, thanks for showing us. It's nice to know that we've got people building models. You'll be able to read more about his build and others in the February 2019 issue of BRM, on-sale January 3. And, if you've built one of the kits as-designed, or modified it, please let us know how you found it went together and what you've made with it. Send a few sharp and well-lit photographs to me via PM for a chance to win another Metcalfe kit for your collection. Just wondering if anyone has received their DVD through the post yet? I hope you don't mind 2 further questions (from a guy who's having a job remembering his "World of Railways" login details - and who's recently been too busy to go hunting for them). Are there any plans to take some of these DVDs to shows like "Warley" - so readers can collect them there and save Warners the postage? As for future DVDs, is there any possibility of download links for the content being included in the magazines (preferably in the same place each month)? That way, it would be relatively straightforward to avoid any further "DVD-gate" style controversy in future. Yes, I received mine during the middle of last week. Though my DVD didn't have to travel as far as Lanarkshire so yours may still be in transit. Just got home to find the DVD in the mat. Supernatural forces at work methinks. Looking forward to a relaxing evening viewing. The Perry Barr video in the digital edition has stopped working. Any chance the link can be updated or sent via pm? Sorry I missed this, it should be working OK.
Re the extra charge because of the kit. I'm surprised at this as Railway Modeller has produced kits, both card and plastic, with their December issue for several years at no extra cost and they have been available with the shop edition and the subscription issue. Can someone explain why BRM charges extra and RM does not. That's an individual magazine's call based on costs, margins and distribution methods. Their 'gifts' undoubtedly cost too but ours are externally sourced.